RADIANT SILVER IDOL, BUDDHA OF KNOWLEDGE. 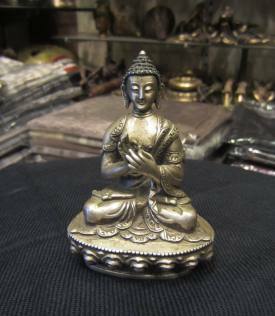 Buddha Shakyamuni Pure Silver Statue in Teaching Mudra representing Knowledge, Wisdom and Enlightenment. Shipping Time: Fifteen days to One month. Return to Buddha Bazaar - Buddha Statues Main Page.